Fourth of July fireworks are a big source of air pollution, study finds. Gasp! 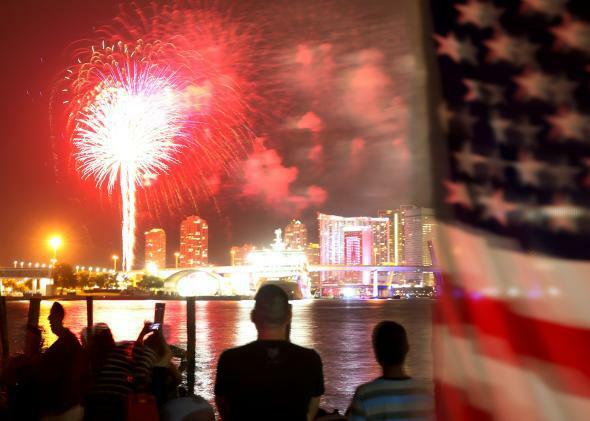 A new study shows Independence Day fireworks are a big source of air pollution nationwide. Here, spectators watch a 4th of July fireworks display over Miami in 2014. Fourth of July is a boon for daredevils. Even ignoring the widespread drought in the West, it’s the No. 1 firefighting day of the year. Last year, more than 10,000 people were admitted to the hospital for fireworks-related injuries—with intoxicated underage boys a major accident-prone demographic. Turns out, all those backyard pyromaniacs are contributing to a big health risk for those of us sitting back in the lawn chairs, too. 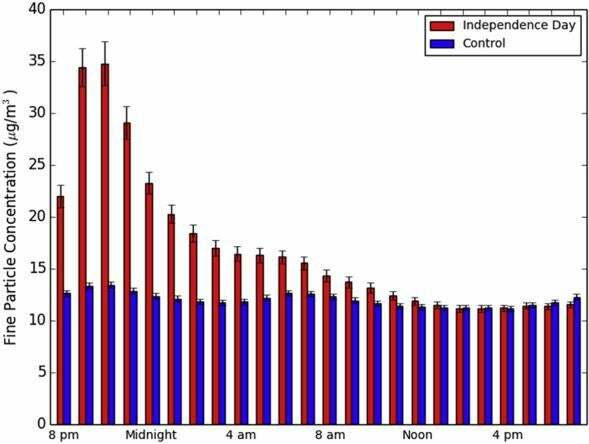 A new study shows Fourth of July fireworks extravaganzas release huge amounts of pollution into the air. If the weather conditions are right, it’s enough to cause a health risk. Seidel and her colleagues at NOAA conducted a statistical evaluation of 315 air-quality-monitoring sites nationwide between 1999 and 2013, and they found a consistent spike in toxic levels of fine particulate matter to unhealthy levels at 10 sites, including Chicago, Los Angeles, Las Vegas, and Seattle. Even nationally averaged, fine particulate matter pollution more than doubles on July 4th. There’s a big spike from fireworks-caused air pollution on July 4th, which leads to a doubling of fine particulate matter even when averaged over the entire country for multiple years. Could one day actually make a difference in Fourth of July revelers’ health? Maybe. A 2011 study of fine particulate pollution spikes in Italy—exactly the kind studied by Seidel and Mass—was linked to an uptick in hospital admission for heart attacks. Exposure to high levels of fine particulate pollution can result in decreased lung function even in healthy people, according to the Environmental Protection Agency. The Obama administration has proposed an updated rule on ground-level ozone, based on new science, that would clamp down on emissions from cars, power plants, and factories. Recently, there’s been pushback from the now billion-dollar-per-year pyrotechnics industry, which is likely overstating the proposed rule’s potential impact on fireworks—which are typically not subject to Clean Air Act standards. Current air pollution regulations typically allow for brief spikes like the ones Seidel’s team found, although a few state and local air quality agencies, like those in Las Vegas, Nevada and Lincoln, Nebraska, have issued pre-emptive advisories in the past warning of the dangers of breathing in too much fireworks smoke. Both cities did so again this year. Fireworks are sources of fine particle pollution, and past air quality monitoring has shown spikes of particle pollution levels in some communities as a result of large-scale fireworks displays. These spikes can be above the level of EPA’s 24-hour health standard. EPA recognizes the importance of fireworks on the Fourth of July and other significant holidays, and EPA’s regulations allow states to request that related PM spikes not be counted in determining whether an area has violated the standard. Short-term exposure to fine particle pollution (hours to days) can pose health concerns, especially for groups of people more sensitive to PM2.5 pollution. So we caution those people to enjoy fireworks from a distance, and from upwind, to reduce their exposure. So basically, as long as you aren’t downwind of the fireworks on Saturday night, you should probably be OK?